I have a confession to make, Piggy Travellers… I haven’t watched any GoT, and I have no intention of watching it anytime soon. Call me a weirdo, but people constantly talking and posting about a series or film puts me off watching it. 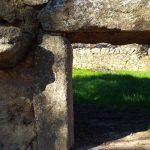 However, as I know there are many GoT fans out there amongst you, I thought I’d start this article by mentioning that the place I’m writing about today is one of the three Game of Thrones locations in Extremadura you’ll be able to spot during season 7. 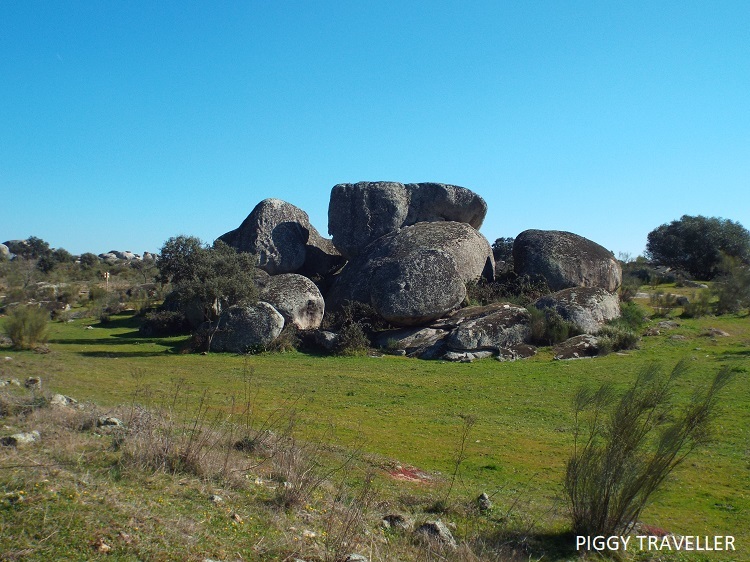 Whether you’re a Game of Thrones fan or not, Los Barruecos Natural Park is worth a visit, so make sure you include it in the list of places to go to during your trip to Extremadura. 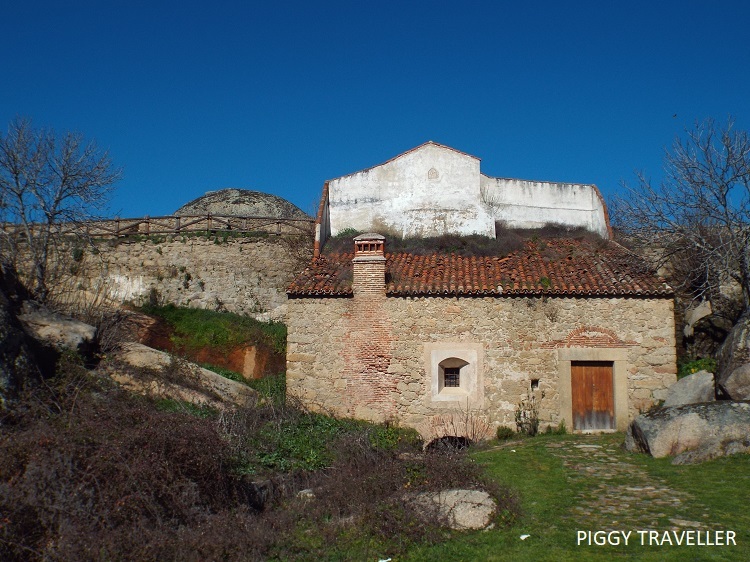 Los Barruecos is located just outside Malpartida de Cáceres and about 16 km from the city of Cáceres. 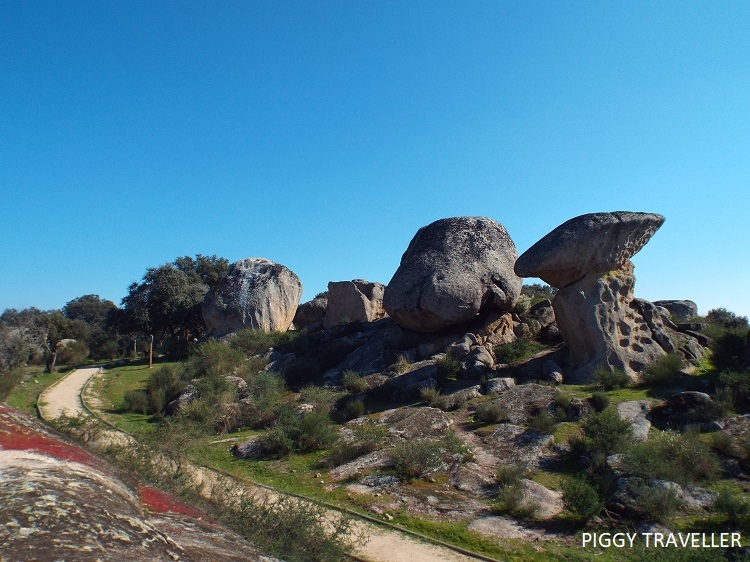 Its name comes from the word barrueco (also berrueco), which is how we call the granitic rocks you can often see in the centre and south of Extremadura. 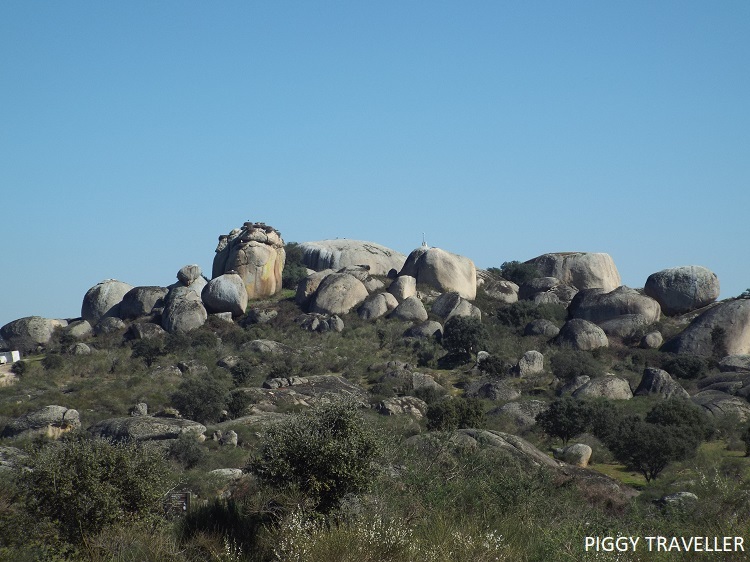 Los Barruecos is a natural area full of those enormous granitic rocks, which create an unusual and original sight for the visitor. 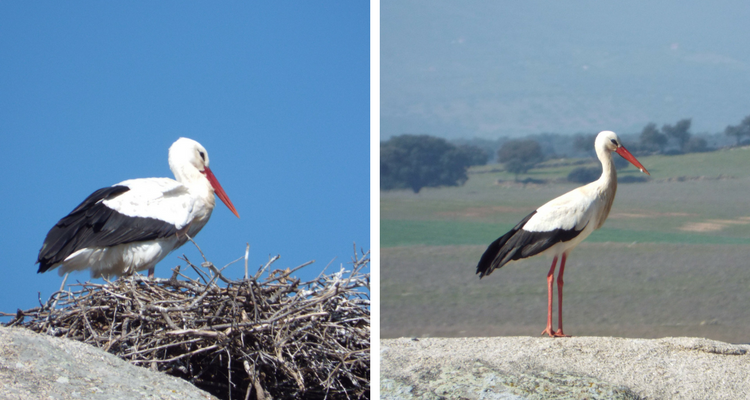 It’s also home to one of Europe’s biggest colonies of white stork and a quirky museum. 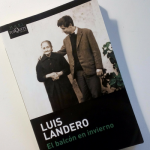 Los Barruecos Natural Park is, therefore, a good place for walkers, birdwatching aficionados and contemporary art lovers (and GoT filming locations fans). 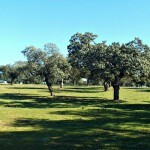 There are six different walking routes in Los Barruecos, with a length ranging from 1.5 km to 7 km long. The 1.6 km Los Sentidos route is fully accessible for children and wheelchair users. 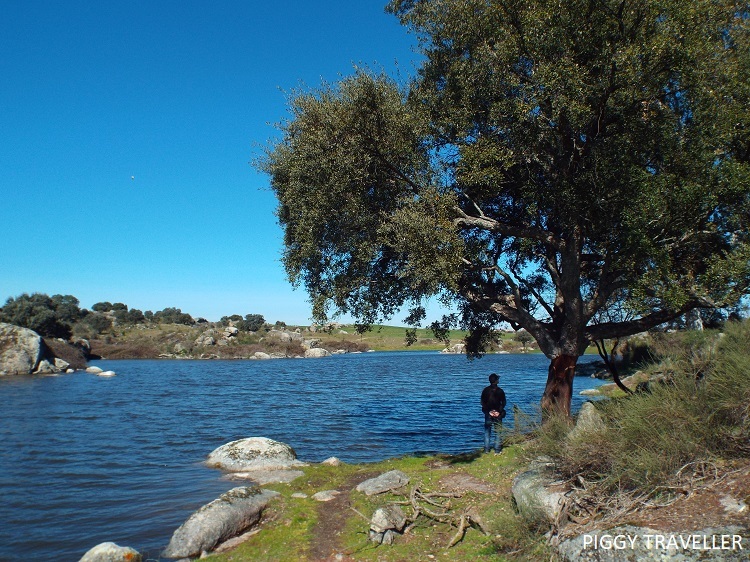 The Natural Park is home to five ponds (charcas), the two main ones being called Charca del Barrueco de Abajo and Charca del Barrueco de Arriba. Pop by the visitor centre (Centro de interpretación del Monumento Nacional) for a map and route suggestions, depending on your time and preferences. Near the visitor centre is a parking area where you can leave your car for free. 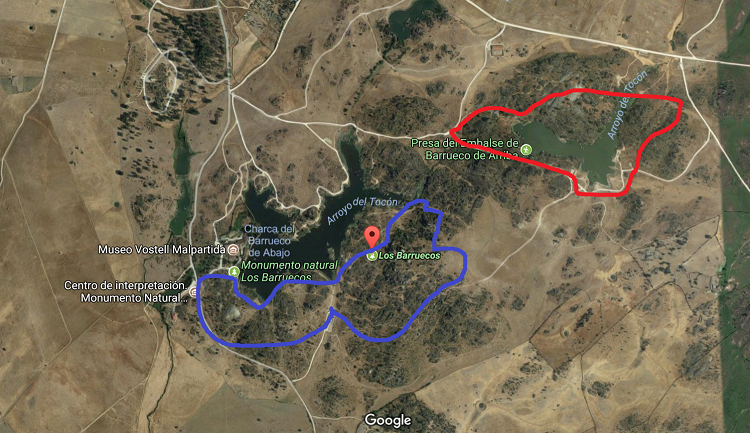 I visited Los Barruecos during a day trip from Don Benito with my dad and we chose two routes: dark blue route Patrimonio Geológico y Arqueológico (4 km) and red route Charca del Barrueco de Arriba (2.5 km) to get a good overview of the two main ponds. The map below (apologies for my lack of drawing skills in Paint) can give you an idea of the routes. 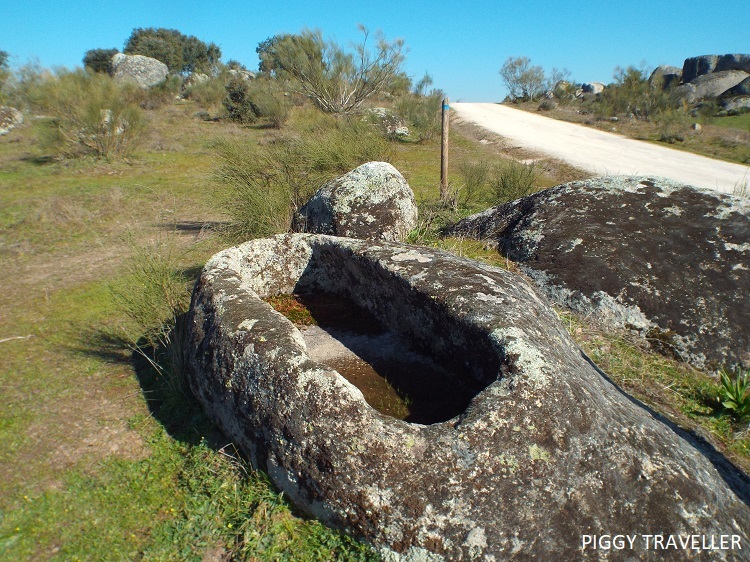 This circular route is the best one to see archaeological remains, rocks and storks. 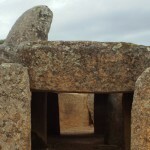 The main highlights are human-shaped tombs and gigantic rocks that resemble a tortoise (Peña la Tortuga), a mushroom (Peña la Seta), a snail (Peña el Caracol) or a shark (Peña el Tiburón), among other things. Some of them are huge, and it’s fun to climb them up and enjoy a good view of the surrounding plains from the top. Some isolated rocks hide cave paintings and you can also see the remains of a former Neolithic settlement. 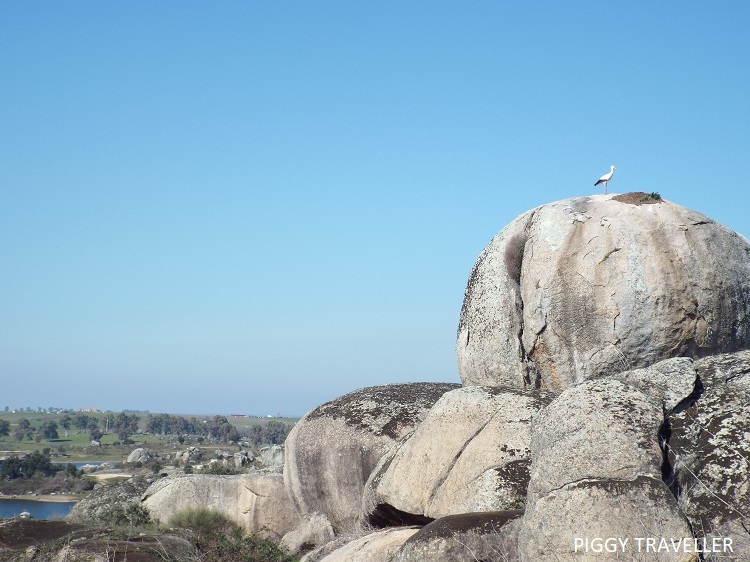 The biggest and most popular group of rocks is known as Peñas del Tesoro (The treasure rocks), the treasure being seeing the storks that have nested on top. Taking binoculars with you is a good idea, so you can spot these and other birds from the distance. Near the rock you’ll see two outdoor sculptures that belong to the Vostell Museum. One of them is called El muerto que tiene sed (‘the thirsty corpse’) and is located on top of a rock. The other one is called VOAEX – a concrete structure depicting a car into a wall. 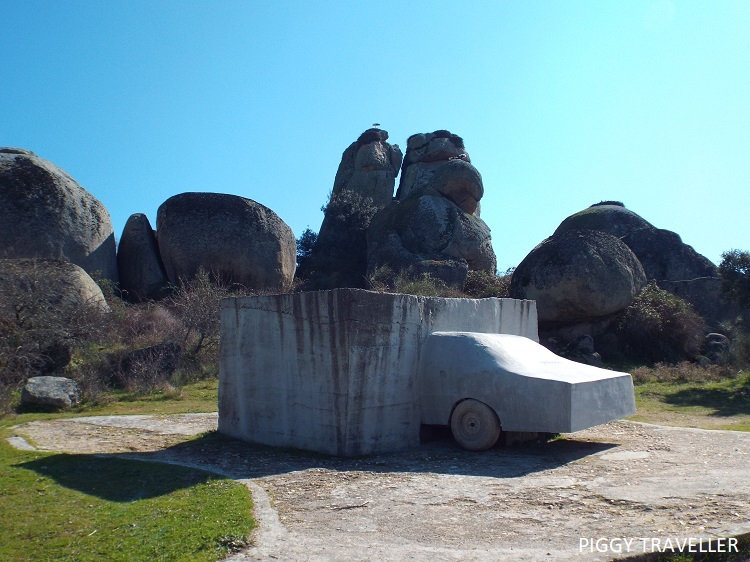 The last part of the route runs along the southern tip of the Charca del Barrueco de Abajo, where you can pay a visit to the quirky Vostell Museum. It was closed when I went, so I have a good reason to go back to Los Barruecos! (I will update this post when I do to include my thoughts on the museum). After having lunch in the picnic area near the visitor centre, we drove up to the Charca del Barrueco de Arriba, past a former mill, and left the car in another free parking area before starting a shorter 1-hour route around the pond. The mill is now closed, but I suggest you climb up the nearby stairs for a view of the pond. The red route isn’t as geologically and archaeologically interesting as the dark blue one, but there is a bit of climbing and several highlights along the way, particularly towards the end of the route. The Peña del Bujío (bujío being a traditional hut) is one of the highest spots in the Natural Park. From there you’ll have a good panoramic view of the park set against the Sierra de San Pedro mountains in the background. It can get quite hot and bright, even in winter. Take a hat, sunglasses and bottles of water with you. There are no shops. The only place where you can eat is the café-restaurant at the museum, and it is closed on Mondays. Pack some sandwiches or other food with you, if you choose a long route. There is a picnic area just outside the visitor centre, where you can use the loo, if you need to. Between mid-February and June access to the the stork colony area is restricted. 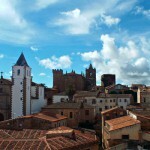 Distance: 16 km from Cáceres; 63 km from Trujillo; 78 km from Mérida. Address: Ctra. A Los Barruecos s/n, 10910, Malpartida de Plasencia (Cácers). Phone numbers: 927 276 236 and 610 761 445. Opening hours: (autumn and winter) every day from 9 am to 2 pm and from 4 pm to 6:30 pm; (spring and summer) every day from 9 am to 2 pm and from 5 pm to 7:30 pm. Opening hours: (spring and summer) Tue-Sat from 9:30 am to 1:30 pm and from 5 pm to 8 pm, Sun from 9:30 am to 2:30 pm; (autumn and winter) Tue-Sat from 9:30 am to 1:30 pm and from 4 pm to 6:30 pm, Sun from 9:30 am to 2:30 pm.